One of the non-aviation blogs that I have been enjoying lately is Escape Adulthood by the creator of the Kim & Jason comic strip, Jason Kotecki. Jason has also recently authored a book called Escape Adulthood: 8 Secrets from Childhood for the Stressed-Out Grown-Up. I hope to pick up a copy of the book soon (I will let you know what I think). His blog and podcast talk about the effects of settting the child inside of all of us free more often. Today when I was in Barnes and Noble I came across Mini Flyers a small book on creating paper airplanes. So I came home and decided to make a few cool airplanes and let the child in me play. While doing this, my wife admitted that she had never had success making and flying paper airplanes. So I folded one up and we had fun tossing it across the house. She is quite the paper airplane pilot. I think most of us pilots by nature are in touch with the child within as we have all followed our childhood dreams of flying. But next time you can't make it out to the airport fold up some paper and take to the air like you did when you were a kid dreaming of flying. 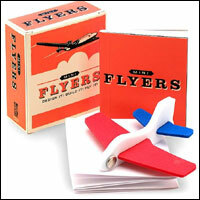 Here are some paper plane resources: Alex's Paper Airplanes and BestPaperAirplanes.com.